I hauled the big Red Book to work today. In case you aren't familiar, this weighty tome is a facsimile and translation of Carl Jung's personal journal, replete with luminous, hallucinatory paintings of dreams illustrating his Hero's Journey. Access a great NYTimes article on its publication here: The Holy Grail of the Unconscious, by Sara Corbett. Jung broke ranks with his analytic companions, chiefly Freud, when he took a less medical/pathological turn into decidedly theosophical territory with his writings and analysis. He saw the unconscious as a repository for a wealth of material to be mined for a more wholly realized life. Access could be gained through art, writing, dreams, myths-- all were sources of soul. Plunging into the collective unconscious, or even dipping our toes in our personal subconscious, can be a frightening task. In America, we do a good job of avoiding it. We keep ourselves crazy busy, fortressed in stuff, cut off from nature, each other, and our own soul. We feel a vague or real sense of dis-ease, or sometimes terror, and we run in absolutely the wrong direction in hopes of comfort. but I have become comfortably numb." It's true, as the country folks say, that if you beat enough bushes you are going to drive out some snakes. But with compassion and what Jung spoke of as modesty and cultivation, there is much to be had by digging a bit deeper. Our lives go by more quickly than we imagine. We find the things we worried about so much in a moment are nothing in the bigger picture. And what we put off-- as I said once to a client, well you can deal with it now and there will be hell to pay. But if you put it off-- it's hell to pay, plus interest. 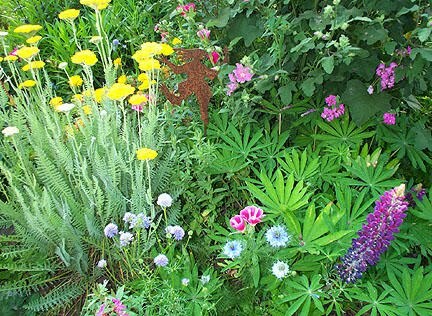 What little piece of your garden has been neglected too long? What waits for you there?